It is human nature to procrastinate, especially when it comes to something that is tedious (and let’s be real; income taxes are very tedious). Rest assured, filing your taxes ASAP is a smart move. It helps your budget, whether you are receiving a refund or having to make a payment. You can plan around either scenario. Hand writing Time for Taxes concept with red marker on transparent wipe board. You can file your taxes pretty easily online and sign up for online payments too, which means that if you are receiving a refund, you can expect to see it in a reasonably quick timeframe, right into your account. Plus, filing your taxes means that you’ll be on track to receive any tax benefits that you might be eligible for, like the Canada Child Benefit and others. 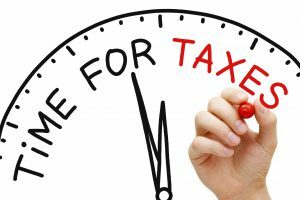 The deadline to file your taxes for 2016 is May 1, 2017. Take this opportunity to review your household budget and identify any areas that could use a boost. If you’ve been playing catch-up with your credit cards, using a lump sum can really give you some momentum. The problem with minimum payments is that they do very little to help to chip away at the debt itself, but address mostly interest charges. Pick your highest interest rate card and put your tax refund on there. What does your savings account look like? Maybe this lump sum could really help as a rainy day fund. Even if your focus is paying down debt, having money in savings is actually strategic in helping you pay down debt. It means that you don’t need to turn to credit if you get hit with emergency expenses. Are there expenses that you often finance- like home repairs or family vacations? Why not plan ahead for that expense by earmarking these funds? It means that your credit balances will stay low because you’ll pay in cash.